Ready to be entertained? Then get your ticket now! By Edgefield Advertiser on October 16, 2014 Comments Off on Ready to be entertained? Then get your ticket now! 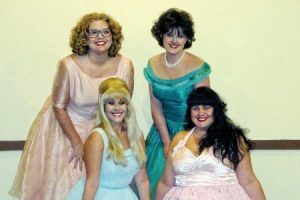 The Wonderettes (L to R) Caroline Bland, Mallory Reams, Cara Doolittle and Whitney McDonald, playing at the Wm. M. Bouknight Theatre in Edgefield this weekend. If entertainment is what one is seeking, the answer is at the William M. Bouknight Theatre in Edgefield where The Marvelous Wonderettes are playing, with energy and desire like one does not often experience. These “Wonders” have been practicing with their coaches (Musical Director Karlton Timmerman and Choreographer Kelly Harris) for four months and, to that, one can give credit for the blend of smooth harmony (Andrews sisters style) and the lithe body responses to rhythm and mood. It is a Wonder! Opening up with great punch in their music and the beginning of the ever-growing show of individual personalities, the musical takes on a pace (and includes audience interaction)that never stops, except for the intermission. And what comes after the intermission takes on an element of surprise that this writer wishes not to take from the potential audience – each one has to experience for oneself. The second act is ten years later and, oh, how the Wonderettes adapt to the 60s. In the 50s (1958 to be exact) watch for the rhinestones and pearls and the glistening fabrics (which actually get more so in the 60s), the winks and pouts and lipstick – the four schoolgirls flit and flutter while staying in harmony. It is electric, with tinsel and glitter to accompany the sounds of the Fifties. And the Sixties — be glad for the hot pants! This writer is sorry for those who are not old enough to have experienced all this in real life, in the times themselves. Sure, there are those who have danced and boogied to these beats, later in the 20th century, but the rush of memories goes with those of age, and be grateful! All this and not one time has a song been mentioned. Well, only twice did this member of the audience hear an off-key – after all this was not in a recording studio where any mistakes could be excluded. This was the real thing, where wrong notes or a vocal slip is going to happen, but almost never in this performance. The performance crescendoes to “Good-bye, Farewell” having taken the audience through some of the all-times greats of the eras and styles in song and performance: ”Secret Love,” “Mr. Lee,” to “Preacher Man,” “You Don’t Own Me,” to name a few. Kudos to the Wonderettes’ leaders – Director Bradley Watts, Musical Director Karlton and Choreographer Kelly. Call for your ticket now (803-637-3833) and enjoy a stellar night at the theatre.